Prepare all ingredients. Saute onions and garlic until soft. Add vinegar, salt and peppers to 5 gallon stock pot, simmer until soft, stirring often. Scoop into blender, do a rough blend for 15 – 20 seconds. Then pour into Foley food mill, and crank until just seeds and skins are left. Transfer to jar, can. Edited to add later: Total of 22.5 half pints. 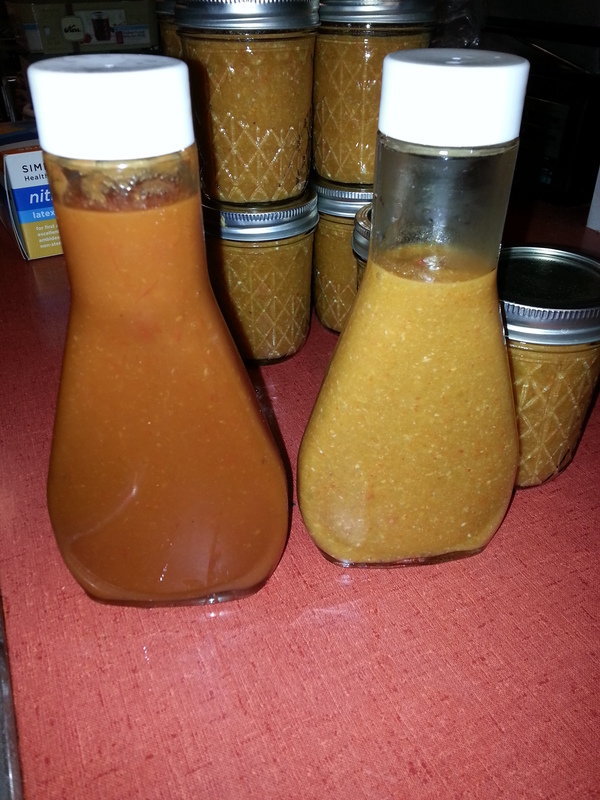 Which works out to about 2 habaneroes per fluid ounce, which is what my standard ‘Evil Green’ (previously my hottest sauce) runs, except that this has a much higher % of fully or mostly ripe habs.And this is clearly hotter than anything else I’ve ever made. Pic below – need a good name for it. It’s the one on the right, the reddish one is my Sriracha (about the color of tomato sauce) for comparison. … but *do* have a very healthy respect for it. The Carolina Reaper is a hybrid cultivar of chili pepper of the Capsicum chinense species, originally named the “HP22B”, bred by cultivator Ed Currie, who runs PuckerButt Pepper Company in Fort Mill, South Carolina, United States. It’s the world’s hottest hybrid pepper. The original cross was a red naga pepper and a red savina pepper. The “Carolina Reaper” was rated as the world’s hottest chili pepper by Guinness World Records according to 2012 tests, averaging 1,569,300 on the Scoville scale with peak levels of over 2,200,000 Scoville Heat Units (SHU). 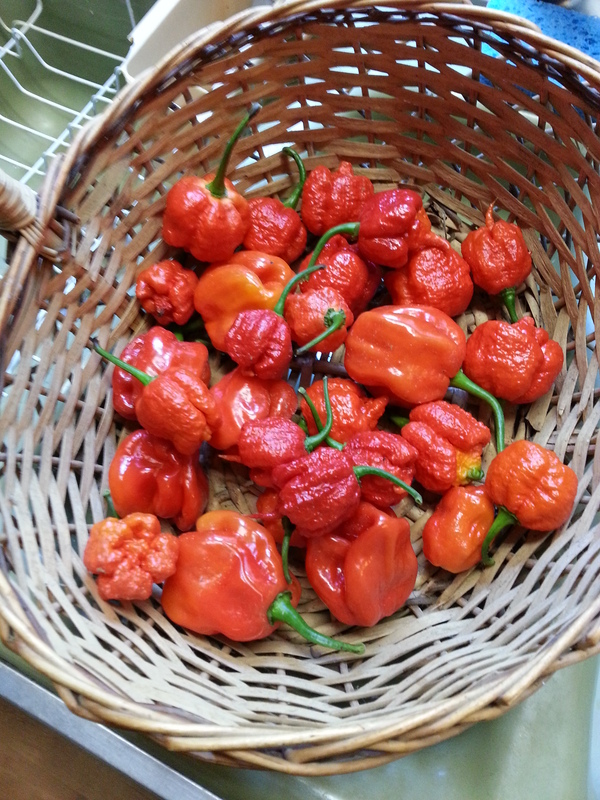 The previous record-holder was the Trinidad Scorpion Butch T.
How are they? Oh, baby! 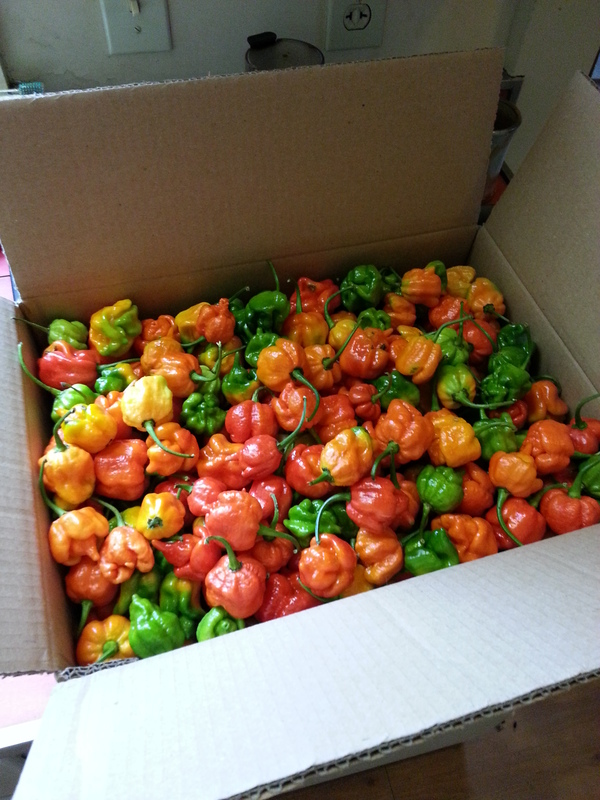 No, seriously, trying one of these peppers is sort of the equivalent of seeing a live, active volcano. Sure, it’s insanely hot (I ate the smallest little piece, about the size of an apple seed, and it did the whole ‘mouth numb, face flushed, lips melting, nose running’ thing). But it’s also insanely cool to just experience the thing … if you exercise a little respect for its power. And they have the same flavor profile as other super-hot Habaneros, which is actually why I like them. It’s a deep, smokey, lasting peppery flavor. 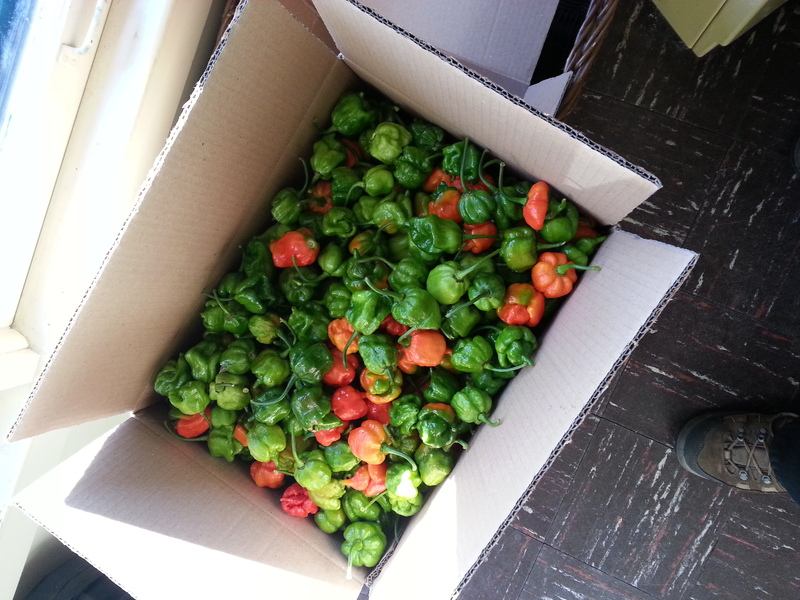 I’ve only harvested about 60 peppers from my plants so far this season. For some people, that would be about 59 too many. But if the weather holds, perhaps I’ll have a total harvest along what I’ve gotten in years past. *Of course. And if you would like to order your own fresh super-hot peppers, you can do so from the same place I get my seedlings each year. Digital List Price: $3.01 What’s this? See? It’s free! Today through Sunday! Go get a copy! Tell your friends to go get a copy! Tell your dog to go get a copy! But not your cat. Cats prefer to read the wallpaper. You know how they are. Seriously, Happy Fourth to one and all.